First, the real good news... if you prepare these Maple Flavored Veggie Sausage Patties by frying them (I use just a dusting of cooking spray), your kitchen fills up with an amazing breakfast fragrance. If you close your eyes, you can easily imagine you're in a diner in the midwest... sausages and pancakes are frying on the industrial griddle... a nice old couple at the counter drizzles maple syrup over waffles... a waitress named Shirley or Flo refills your coffee... she has great legs for her age. Yes, this is a product that smells wonderful. Now for the not-so-great, yet not-too-disappointing news... the flavor, while decent, doesn't capture the magic of the aroma. If your familiar with the original version of these veggie sausages, you know the deal. The texture and taste is reminiscent of real sausage, but they're not going to fool anyone. They don't taste like meat, but they do manage to satisfy the section of your brain that craves sausage, namely the primary gustatory region of the cerebellum (or forebrain) via the the hypoglossal and trigeminal nerves. Morningstar Farms sausages have a lot of fans and I'm one of them. Being a breakfast expert, I eat more than my fair share of real pork products. So, it's nice to have a quality non-meat alternative. I remember being impressed with the flavor of the original patties when I first tried them. Now days, I probably crave vegetarian sausages almost as often as the real thing. So to sum up.... Morningstar veggie sausages are good. 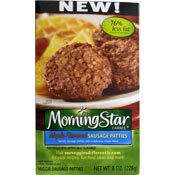 New Maple Flavored Morningstar Veggie Sausages are good* (but with an asterisk). * The maple flavor comes across in the mouth as simply sweetness. It's a nice change-of-pace to have that sweetness when the sausage is combined with other breakfast foods, ie. when it's part of a breakfast sandwich. But when eaten alone, the sweetness becomes a little overbearing and it's mildly irritating that the maple flavor described on the box isn't coming across in your mouth. Instead of this product, I recommend drizzling a little pure maple syrup over original Morningstar veggie sausage patties. Nutritional considerations: Each single patty serving has 80 calories, 3 grams of total fat (0.5 grams saturated and 0 grams Trans), 0mg cholesterol, 5 grams total carbs, less than 1 gram dietary fiber, 2 grams sugars and 10 grams protein. What do you think of Maple Flavored Veggie Sausage Patties? I've only tried the original patties, but like them quite a bit. For an ersatz meat product, they really do impress me. Very much like eating turkey breakfast sausage patties. I love some Morning Star products, like bacon and hot dogs. The Maple Flavored Sausage was a bomb! They had little flavor, tasted like over pre-cooked whatever (not meat). NOT good like usual products (Oh, give me the bacon!) Wanted a sausage/biscuit for breakfast. Just had fruit and toast. So craving remains. Will search for another brand. The patty was pre-coked, burned, dry. Back to the kitchen, you guys. Send in some pros! They used to be so good. But now, the texture is off and the flavor is weak. I have moved away from Morning Star. Earlier they were my 'go to' brand, but the quality is no longer there. 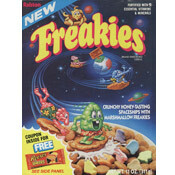 These were actually my favorite at one time. Having been a vegetarian for years due to medical reasons, I cannot honestly remember the taste or texture of meat. Being that this is a product whose target demographic consists of people unable or unwilling to eat meat, I feel that perhaps comparing it to the real deal is holding it to too high a standard. I've found that if you microwave them a little longer than necessary they tend to not be so squishy inside, and the texture is substantial enough to resemble my memory of sausage and provide a satisfying supplement to my meal. I find the flavor itself a little mild, and I do agree that they taste sweet rather than like maple. However; I am confused as to where you are learning about the functions of the brain, as the cerebellum is located at the base of the skull (not the forebrain)and regulates voluntary muscle movement, balance, and equilibrium. The 'gustatory region' of the brain has not been formally located, but it is theorized that it resides in the parietal lobe and does not make you 'crave' foods, rather, it reacts to taste. The hypoglossal nerve controls the muscles of the tongue, and the trigeminal nerve transfers somatosensory information, such a touch or pain, from the face and head, and is also involved with muscles for chewing. What you are basically saying is "These patties register in your brain as food and nerves are involved and you taste it", you would be better off making up something about the hypothalamus. I purchased these damn things by mistake! They need to fix the packaging - I was wondering why my bp's were so sweet! barf.